Sharpless 132 is a faint emission nebula at the Cepheus/Lacerta border, it measures 42 x 30 arcminutes. It lies about a degree southeast of ε Cep. It can be glimpsed visually, but that takes a rich-field refractor and very dark skies. 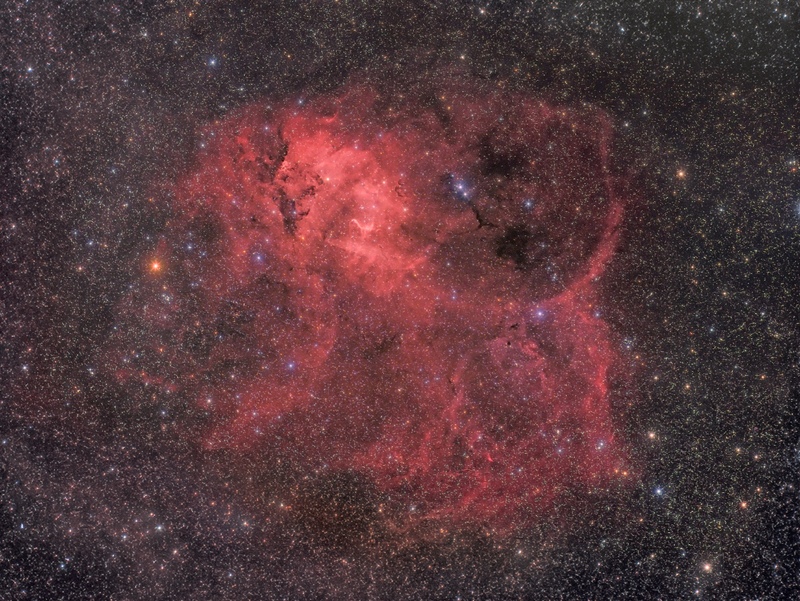 Sh2-132 lies in the field of the Cepheus OB1 association. It is related to Cep OB1, whose distance is given as 10,000 to 12,000 light-years, thus it is located in the Perseus arm of our Galaxy, and measures more than 250 light years in extent. Some photographers call it "The Lion Nebula" due to its shape (head upper left, tail to the right, four legs below). It features a conspicuous dark lane in the "head" section. IC 1396 and Surrounding Area, telelens photograph. Sharpless 132 in Hα, which is part of this image. Notes: A combination of Hα and color images taken with the TMB refractor on a parallel setup plus older TMB images (also for color). All CCD exposures were taken during my stay at the Großglockner-Hochalpenstraße in September 2013. See an Observation Report of this event (in German): Glockner 2013.